It just takes a simple idea and someone to say yes. I am always amazed and motivated hearing about someone having a simple idea and being brave enough to ask "what if...". In this world I find it easy to become overwhelmed, overwhelmed with the need, sadness, struggle and hurt that so many are living. There are kids dying each day because of hunger, families huddled together freezing on the streets because of homelessness and kids walking into school embarrassed and ashamed because they don't get to brag about their cool birthday party. 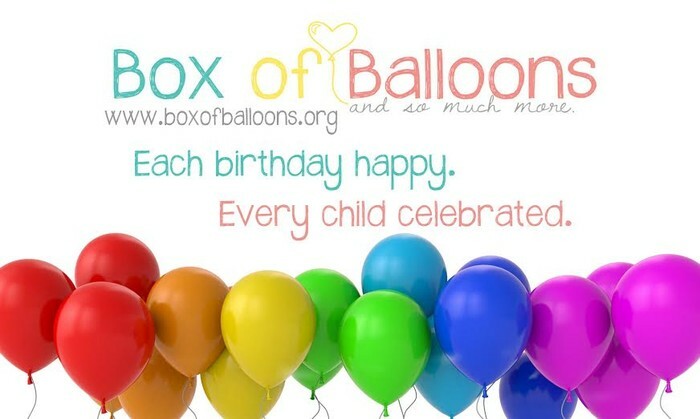 Box of Balloons came from a simple idea, a what if question and now we together are changing the world little by little. A single birthday box or day of happiness may not change the world but it may change the world for that child and they may someday start another non profit to help others or lead a company who gives back or do one random act of kindness that changes the life of a stranger. Our once simple idea is slowly moving across the country and turning into a big idea that is impacting hundreds of people. The number of birthday boxes continues to increase each month which means that many more lives are being touched. By YOU. I love how that video depicts the ripple affect that one simple idea can have! Continue to spread the word, share Box of Balloons with everyone so that we can continue to touch lives and spread to even more states! 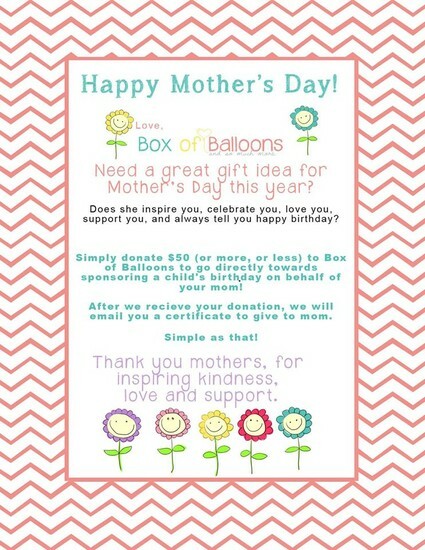 Don't forget to honor your MOM this Mother's Day! Click HERE now.